So after my previous post about how many designs I could do using only 2 colors, and scotch tape, a fellow NB'er, suggested a zig zag design. Well, let's be honest, I'm pretty lazy, lol. So I came up with this design, It's my interpretation of zig zags, lol. My hubby called it the Shredded Mani, lol. Here is how I cut my tape. Before I cut it, I taped it to my palm a few times. I had already had my base color polished on, but didn't get a pic. It was China Glaze Light as Air. 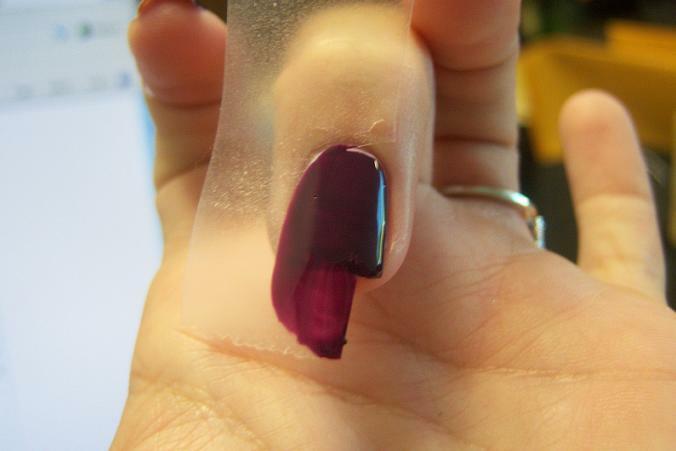 Then I taped it to my nail, and I polished over it, with Sally Hansen Plum Luck. After I removed the tape, this is what I had, and I LOVED it! Amazing! This looks great, but I imagine it was a PITA. I am inspired to do so many things now! Thanks for all your ideas!!! I agree with Fey! I'm so glad G, shared your site with us! Hey, I just found your blog. Your manicures are amazing! I'm definitely going to give some of them a try. What a trick for the "shredded" mani. Thanks for sharing! 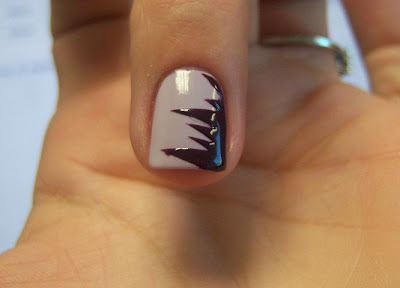 PS: This new mani is pure genius! I'm soooo going to try it! Aww, well thanks again for everything!!! You should really try this mani! It's not as time consuming as some may think. The worstpart is preparing the tape pieces. This looks is so incredibly awesome! I'm doing now as I type this! Lol! Thank you so much for this tip! It's brilliant!!!! Thanks Lindsay!! Oh YAY, what colors are you using? That's such a cool trick!! thank you.i'm going to try it. MM, thanks, you def should! 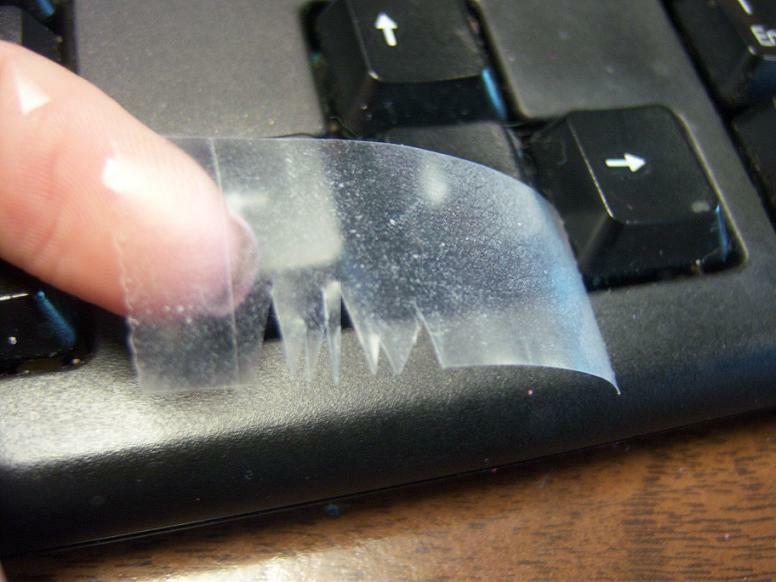 never thought a scotch tape could do something like this.. u've got such amazing ideas.. & this is the best nail blog ever...you rock!!! i havea question, how long after you put on the base colour do u wait before applying sv ? then, how long after applying sv do you apply the tape ?? i just did this design for the first time because you inspired me! i used Essie's lady like and mint candy apple and it looks awesome! i posted a picture on facebook and shared a link to your blog because people were asking where i found this idea! Does that "never again" mean you plan to get experienced and not let the tape bleed again or you're never doing this design again? Your designs are so cool! i lovvee this!! i just did it using Zoya's Ali as a basecoat and China Glaze's mistletoe me as the top coat! I have this same colour, Plum Luck and I love it! It's one of my favourites. I did a diagonal mani with this an silver sparkles with tiny white dots on the line. I called it "Visions of Sugarplums" because I'm a dork lol :-P love these tutorials! Thanks for posting them. 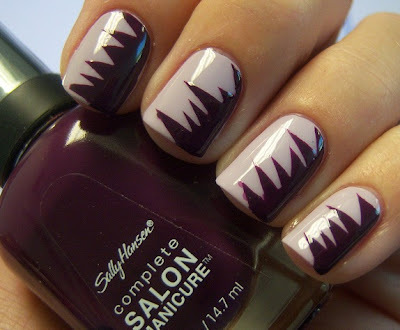 All are really awesome nails fashion shredded mani. it is best of all nails fashions blog.